The Coolest Event In 16,000 Years. They came...they thawed ... they conquered the hearts of audiences everywhere in the coolest animated adventure of all time! Heading south to avoid a bad case of global frostbite, a group of migrating misfit creatures embark on a hilarious quest to reunite a human baby with his tribe. Featuring an all-star voice cast, including Ray Romano, John Leguizamo and Denis Leary, Ice Age is ""a pure delight"" (New York Daily News) for all ages! 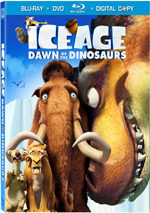 This 2-disc set is loaded with exclusive Ice Age extras. $46.312 million on 3316 screens. One of the "Easter Basket Approved" Titles from Fox/MGM. For years, studios other than Disney or DreamWorks found it difficult to produce hit animated flicks. 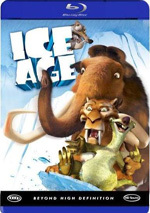 That began to change in 2002 with the success of Fox’s Ice Age. Previously, flicks like Warner Bros.’ Pokemon: The First Movie and Paramount’s The Rugrats Movie made some decent change, but they came from already established TV series. Disney and DreamWorks produced original successes over the years, but no one else seemed able to crack that collective monopoly. Fox sure tried hard in the years prior to 2002, but they never succeeded. Many of their flicks went by largely unnoticed, and they also scored some notable bombs. 2000’s Titan AE decimated their animation department because it registered as a terribly expensive flop; with a budget of $75 million, it raked in a poor $22 million. In regard to Ice Age itself, I must admit its success surprised me for reasons not limited to the studio from which it emanated. Admittedly, I didn’t expect anybody other than Disney or DreamWorks to score animated hits, so logically, I figured Ice Age would tank just because Fox produced it. However, that wasn’t the only reason I thought it wouldn’t make much money. I saw the flick during its opening weekend and felt genuinely underwhelmed with the product. While the movie seemed modestly entertaining, it lacked much spark and appeared fairly ordinary. Have additional screenings altered that opinion? Nope. Again, the film seems generally watchable, but I think it fails to become anything much more compelling than that. Ice Age opens with a sequence that has virtually nothing to do with its plot. We see Scrat the squirrel as he tries to bury an acorn. After this comic beginning, we meet our main characters. Sid the sloth (voiced by John Leguizamo) gets left behind at the start of the yearly migration. As he rushes to catch up with the gang, he runs afoul of some rhinos, and he gets Manny the mammoth (Ray Romano) to rescue him. A definite loner, Manny doesn’t want to go south with the others, and he doesn’t want anything to do with Sid either. However, the chatty Sid won’t take no for an answer, and he clings to Manny. In the meantime, we meet a clan of saber-toothed tigers led by Soto (Goran Visnjic). Logically cheesed after a group of humans slaughtered their kind, they plan their revenge; Soto wants to eat a baby. They attempt their attack, but the mother escapes with her infant son. She doesn’t survive, but Manny and Sid find the child. Manny wants nothing to do with the boy, but Sid insists that they return him to the other humans. Into this situation comes Soto’s right-paw tiger Diego (Denis Leary). Soto sends Diego to obtain the baby. When the pack discovers that a mammoth became involved, this sets their stomachs to growling. They hatch a plot in which Diego will lead Sid and Manny to a trap. There the tigers will slaughter the baby and the mammoth and enjoy some good eating. Diego meets up with Sid and Manny. He feigns interest in the baby’s welfare and declares that he can help them quickly return the child. From there, the remainder of the movie follows their journey to find the human tribe and bring back the boy. Many inevitable plot twists ensue. Does it count as a spoiler if I indicate that all three animals become attached to the baby? Maybe, but that development seems so inevitable that I can’t regard it as something that would catch anyone by surprise. Really, little about the story of Ice Age offers anything terribly original. Yeah, you don’t see too many movies with packs of prehistoric animals who try to save human babies, but once we strip the story of that novelty, it falls into more predictable traps. Not that I regard this as a bad thing necessarily. Movies don’t need to be wholly original to be good, so Ice Age still had a lot of potential. Many parts of it succeed quite well. The film mixes humor with emotionality in a nice way. For example, when we learn more about Manny’s past, the flick executes the material in a touching and memorable way. The picture’s climax also includes an impressively moving element. However, much of the flick simply seems ordinary. The animation runs into serious problems. I didn’t think the visuals looked great eight years ago, and they’ve aged poorly since 2002. At times, the animals manage acceptable levels of depth and movement, but they don’t go beyond that, and they sometimes lack a real organic feel. There’s a plastic sense to the elements, and that goes for both characters and sets. Ice looked like glass, snow looked like Styrofoam, and water looked like plastic globules. Worst of all, the humans were totally unacceptable. They appear to come straight from videogame cut-scenes; the crudeness of their depiction astounds me. I don’t blame the age of the film for the poor quality of the animation; older CG flicks like 1999’s Toy Story 2 still look great. 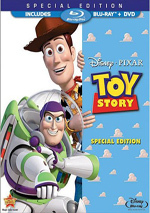 Even 1995’s Toy Story - the original full-length CG animated movie, and one with technical flaws – offered superior visuals when compared to the often stiff, ugly images here. The voice acting also appears competent but unspectacular. Actually, that fact surprises me. All three of the lead actors are quite talented, and I’d expect them to shine in this setting. However, they come across as somewhat bland and unmemorable. Leary appears especially neutered as Diego. He provided such a great turn as the surly ladybug in A Bug’s Life, but here he feels flat and bland. Even Diego’s funniest scene – in which he plays a scary game of peek-a-boo with the baby – works mostly due to the visuals; Leary fails to contribute much to the role. Ultimately, Ice Age gives us a moderately entertaining piece of work, but it doesn’t really impress me. After a few screenings, my opinion remains the same. It offers some gentle humor and a modicum of effective emotion, but it lacks the panache or inventiveness of better animated movies. Actually, when compared with the majority of animated films, it seems pretty good. However, the majority of animated films stink, so that doesn’t say much. In the end, Ice Age provides a moderately enjoyable flick and nothing more. Ice Age appears in an aspect ratio of approximately 1.85:1 on this Blu-ray Disc. Ice Age presented a good image but not one that matched up with the best CG animated transfers. Sharpness generally appeared very good and could be excellent. However, occasions occurred, as some wide shots looked a bit soft and tentative. Still, the majority of the flick was concise and accurate. Jagged edges and moiré effects created no concerns, and I also detected no examples of edge enhancement. As for print flaws, I saw none. Ice Age featured an earthy, natural palette, and the colors consistently looked fine. The various hues came across as warm and vibrant, and they showed no problems related to noise, bleeding, or other concerns. Black levels seemed deep and dense, but I thought shadow detail looked a little heavy at times. For example, the tiger attack on the human village appeared somewhat too thick. The movie looked good enough for a “B+”. I felt a little more pleased with the DTS-HD MA 5.1 mix of Ice Age. This active track made positive use of all five channels. It placed elements appropriately and showed positive localization and blending. For example, one scene featured a waterfall on the left side of the screen. The roaring water neatly occupied both the front left and rear left speakers, which made it nicely involving. Different elements also moved cleanly from channel to channel. Whether side to side or front to rear, those pieces meshed together seamlessly. The whole package blended neatly and presented a lively and engaging soundfield that helped embellish the film. Audio quality also came across as solid. Speech seemed natural and warm, and I noticed no issues related to intelligibility or edginess. Music sounded reasonably vivid and dynamic. I felt the score needed a little more oomph at times, but it usually offered a rich representation of the material. Effects also packed a nice punch. At times, I questioned whether Manny’s footsteps seemed too gentle; they didn’t provide the loud bass response I expected. However, I felt this probably occurred as a design decision; since Manny played such a heavy role in the film, it’d become distracting to constantly hear those stomps. Otherwise, low-end material sounded deep and resonant. The audio of Ice Age provided fine addition to the project. How did the picture and sound of the Blu-ray compare to those of the movie’s original DVD edition? The audio was pretty comparable; the lossless DTS mix might’ve been a little more dynamic and involving, but I didn’t discern any substantial improvements. Although I wasn’t bowled over by the transfer, it still managed to outdo the DVD version. While the latter looked great for its format and its era, it couldn’t compare with the greater vivacity and resolution of the Blu-ray. The Blu-ray has some room for improvement, but it’s still the strongest rendition of the film on the market. 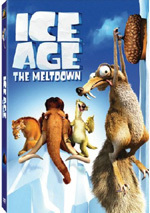 Although the film’s 2006 ”Super Cool” Edition offered plenty of extras, the Blu-ray version of Ice Age only comes with a handful of components. A bigger disappointment, it fails to even duplicate everything from the 2002 DVD. Still, the elements we get are pretty good.. We start with an audio commentary from director Chris Wedge and co-director Carlos Saldanha, both of whom sit together for this running, screen-specific piece. Overall, this seems like a good but unspectacular track. At the start, Wedge heavily dominates the piece, but Saldanha becomes much more involved as it progresses. Both provide some nice notes about topics such as why the film opened with Scrat, changes to the original script and other alterations made during the production, and different animation challenges. Unfortunately, quite a lot of the track consists of simple praise for the film and its participants, and this waters down the proceedings noticeably. As a whole, the commentary gives us some good information about the production, but too much happy talk makes it less compelling than it should be. Six Deleted Scenes appear. Each of these runs between 46 seconds and two minutes, 19 seconds for a total of eight minutes and 22 seconds of footage. Most offer fairly complete animation, though one - “Sabre Stake Out” – remains pretty rough. Sid features prominently in all but one of the clips, and we see a few alternate introductions to that character. Overall, these scenes seem interesting to see. One can watch the deleted scenes with or without commentary from Wedge and Saldanha. They provide some general information about the segments and – more importantly – they tell us exactly why the snippets failed to make the final cut. The commentary offers some useful information and seems better focused than the material the men offered during the main film. Referred to as Scrat’s Missing Adventure, we find an animated short called “Gone Nutty”. Scrat the squirrel again obsesses over acorns in this cute and inventive cartoon. “Nutty” lasts four minutes and 44 seconds. Some ads finish the set. We get three trailers for Ice Age as well as clips for Planet of the Apes, The League of Extraordinary Gentlemen and Fantastic Four. While I enjoyed Ice Age, I frankly can’t figure out why it became such a big hit. The movie offers a gently amusing diversion but it lacks the cleverness and wit that enhance the best films in the genre. The Blu-ray offers generally good – but not stellar – picture along with very strong audio and a smattering of interesting supplements. Due to its slightly erratic visuals and the absence of many previously released bonus materials, the Blu-ray disappoints, but fans who want the best home video depiction of the flick will still want to check it out.